In Push For 'Common' Standards, Many Parents Left Uneducated The Common Core initiative would standardize academic goals nationwide. Forty-five states have signed on, but lawmakers in some states are rethinking their support. While both sides are stepping up their messaging, a poll out this month shows 62 percent of Americans have never heard of Common Core. The Common Core Standards establish academic expectations across states in math and English language arts. Forty-five states have adopted the Common Core State Standards, the first-ever national academic standards for students. But opposition is growing, and some lawmakers are having second thoughts about their states' support. Meanwhile, proponents of the standards are still struggling to explain the initiative to parents, many of whom say they've never even heard of Common Core. Cynthia Clay has been a teacher and administrator in Middletown, Del., for 31 years. "I have seen it all, because we have had things come and go in education," she says. But nothing, she says, has a greater potential to transform public education than the Common Core Standards. She says teachers at her school, Silver Lake Elementary, have embraced them. "In fact, some of our veteran teachers have said, '[Common Core] has given me more direction than what we've had in the past,' " Clay says. Two years after Delaware aligned its state tests to the Common Core, Clay says her students are doing just fine. "They are meeting the standards — that's what we're seeing," she says. "And in our state assessments, we're seeing that happen as well." Raising the bar for all children, regardless of where they live, and then comparing their progress based on the same high standards, makes sense, says Lilian Miles of the Appoquinimink County Schools, which includes Middletown. "I can't tell you how often parents get frustrated when they find out that the Pennsylvania state test has nothing to do with New Jersey, has nothing to do with Delaware. There's no common comparison," she says. The Common Core will change that, according to Delaware Gov. Jack Markell. Markell has been delivering that message over the last few weeks at town hall meetings and back-to-school nights. Although at a Silver Lake Elementary gathering, Markell spent more time than he would have liked explaining what the Common Core Standards are not. New Reading Standards Aim To Prep Kids For College — But At What Cost? "This was not something that was driven by the federal government. I know some people are saying this was a federally driven initiative. This has nothing to do with the federal government," he said. Markell says it was states and governors, frustrated by the meager improvement of their schools, that launched the Common Core Standards. Shortly after taking office in 2008, Markell, a Democrat, and then-Georgia Gov. Sonny Perdue, a Republican, co-chaired a committee to promote the new standards and convince other governors to adopt them. "The easy part was getting states to sign on," Markell says. He says governors only had to look at how poorly their students were doing compared to kids in other industrialized nations. Perdue agrees: States had to do something. "We had become complacent and the goal was to expect more, to have higher standards. In Georgia, we had hearings, and from the State Board Of Education, they had to be adopted there," Perdue says. In Georgia, though, conservative groups and Republican lawmakers — wary of the federal government's support for new standards and tests — now want the state to pull out. 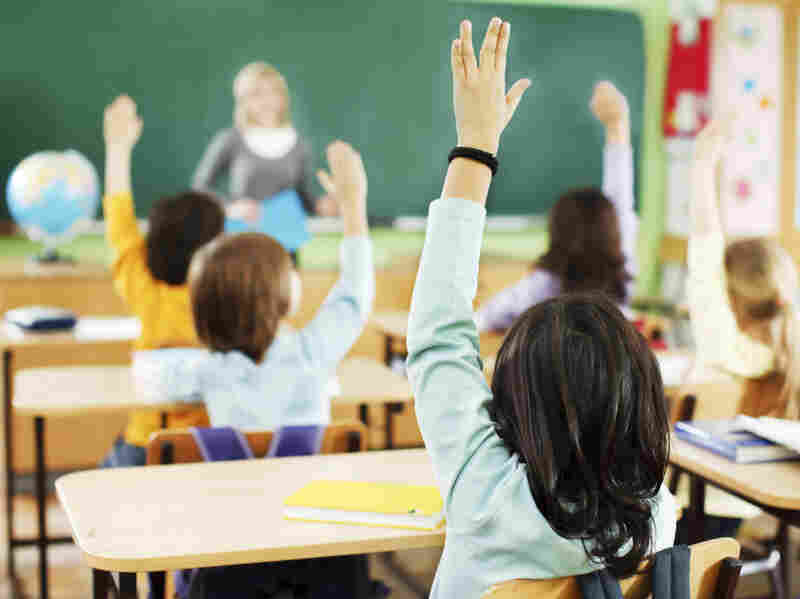 But the arguments for and against the new standards have had little impact on public opinion because, according to a Gallup survey of public schools, 62 percent of Americans have never heard of the Common Core. At a coffee shop in Middletown, the views among a group of young mothers were mixed. Two said they didn't know enough to comment. Only Megan Parker said she likes what she's heard. "My understanding of the Common Core is that if my third-grader were to leave Delaware and go to, say, Ohio, he would not have to test to transfer into the third-grade level there. The Common Core would be universal for all students," she says. Her friend, Beth Hess, has heard both good and bad things about the Common Core. "I can see how conservatives would say it's just another way for the government to take control, it's one more rule, it's one more law, and that we're losing our freedoms," she says. "But I don't think it's meant to be that way. I think there is a good motive behind it: having our children all meet a specific standard at a certain age." With the debate now shifting to the alignment of high-stakes tests to the Common Core Standards, people on both sides of the issue agree that the battle for the hearts and minds of parents will be crucial.